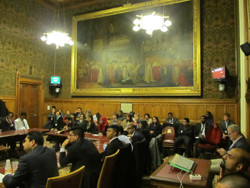 On the 28th of November, 2012, in the House of Lords, we had a splendid event, the very first Youth Committee to launch a Youth Interfaith Council in the House of Lords, we were graced by the presence of two members of House of Lords. 56 Attendees, there were quite a number of new guests some of whom were attending their first Interfaith event. The event started with Christa Kamga, introducing Matthew Huish who was had the idea/ project manager of this council. Matthew presented a most wonderful and inspiring vision of the Interfaith Council, which personally touched my heart and impressed me. Matthew spoke for approximately 15 mins and it was very well welcomed. After his speech, Lord King warmly congratulated Youth UPF and praised the initiative for YIC, he also mentioned how it was time for the young people to step up and do such good works, as many times youth are misunderstood or seen as a problem in the society, hence we should be an example to show the world that we can make things well, and create a better place for the future. There were cheers of applause with gratitude of the support and understanding on the part of Lord King as well as Matthew’s initiative. After Lord King’s congratulatory remarks and encouraging words, we had around 6 people from the audience give comments and ask questions. The questions where mostly answered by Matthew as they seemed to be direct questions to him. After which Asuka Ostberg gave a great presentation about Religion. politics and Society which she is currently studying at Kings College. This was followed by talk by Nasir Gilani and Shabnam Khan (who not only gave good talks but contributed substantially in responding to questions from the audience). We also had a talk by Kishan Devani who works with Lord Poppat. Lord King introduced Lord Poppat who gave a very heart to hear speech. 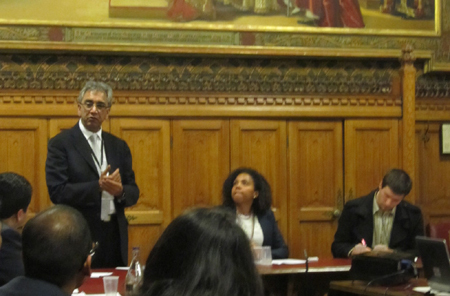 Lord Poppat's speech was very warm and supportive of YIC vision and he explained that he himself is a very interfaith minded person and always does his best to attend every Interfaith event that he knows about. Lord Poppat also, talked very openly as to how he became such a person and how he values and respects each and every faith. In fact at the end of his speech Matthew directly asked if we could depend on his support and he consented. A dynamic discussion followed once again .There were questions and very constructive comments from a few people like Dimitrie, Pascal, Mohammed, Asmaa, Indie, Marcus to which the contribution of Neil, Keldon, Sonja, the panel & audience as a whole was very helpful. It was like One Family Under God. Some good memorable comments include: When we come to this room, we should be one body; only in this way can we united show a model of peace for the rest of the world. The event was also attended by Asian Voice who will write an article on it. We should never forget the very good contributions, advice and care from Margaret Ali (Director of UPF-UK) and concluding remarks and support from Robin Marsh (Secretary General of the UPF- UK). The event was very inspiring. We were networking and discussing so excitedly that we only exited the room when House Of Lord security came to tell us that we overstayed by half an hour and that we must leave. We want to thank you all for supporting me and the team in one way or the other and a special thank you to Matthew coming up with the YIC concept, Bandana for her efforts in bringing a number of new guests.